As a creature of habit, it really is very easy to simply return to the same destinations, especially if I have previously enjoyed my time there. In a previous post on how to record which countries you visited, I realised I have only visited 7% of the world. 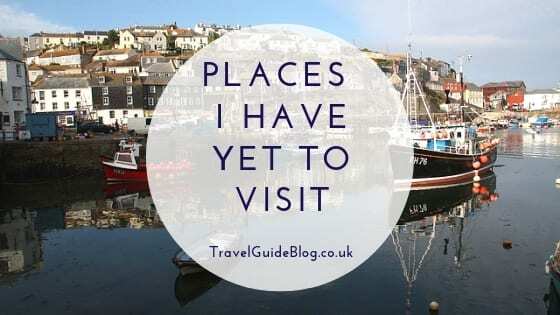 With so much to see and experience, I have been thinking about the places I have yet to visit, with some destinations a little closer to home than expected! Despite many holidays as a youngster spent touring around the UK, the South West coast is still a part of England that I have never visited. Google Maps tells me that it is a 6 hour journey, though I am not aware of many people from Manchester hitting that driving time. During holiday time you can easily rack that journey up to 8-9 hours, possibly even more, so lay overs would break the journey up slightly. Such a picturesque part of the country though, it’s understandable that programmes such as Poldark and Doc Martin are filmed there. With a host of gorgeous fishing port villages such as Boscastle being a major draw for tourists, Cornwall is famous for it’s Cornish Afternoon Tea and it would be rude not to indulge whilst there! Surfers will delight at the beaches in Newquay, though if you prefer to keep your feet on land, the Eden Project in St. Austell and Tintagel Castle are must see attractions. Cornwall really is a beautiful part of the UK, offering stunning weather thanks to its location. Maybe not this year, but we shall definitely visit soon. With flight times from Manchester roughly around 4 hours, depending on which part/island of Greece you visit, it makes for a perfect short-medium haul holiday. There are so many islands to visit depending on how you would like to spend your holiday and I have always lusted after a trip to Santorini with the picture postcard-eque white buildings and vibrant blue sea. We are lucky to have friends that reside in Athens, making it the perfect landing point before exploring the islands. The Acopolis of Athens is a sight to behold, dating back to the 5th century BC, on which stands the Parthenon, a former temple dedicated to the goddess Athena. If you are a fan of ancient Greece, this is an experience not to be missed! On the island of Crete, the Samaria Gorge is perfect for nature lovers; for instagrammers, the Melissani Cave on the island of Kefalonia is the perfect picture opportunity. Balos Beach (pictured above) on the island of Crete is a famed lagoon, with its white sand and turquoise water making it one of the best and most popular beaches in Greece. With so much to experience in Greece, it would need a few weeks of travelling and exploring to take it all in properly! The list of places I have yet to visit is endless, I haven’t even got started on Australia yet… that’s a whole week’s worth of posts right there! However, for now, these are just two places that are slightly closer to home that are on my more immediate bucket list.